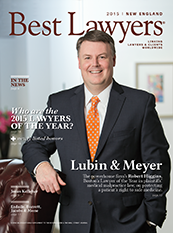 Lubin & Meyer partner Robert M. Higgins is featured on the cover of New England's Best Lawyers published May 1st in The Boston Globe. Higgins, who was previously named Boston's 2015 Lawyer of the Year for Medical Malpractice Law (by Best Lawyers®), is also included in a cover story where he describes his firm's leadership in pursuing the rights of patients and promoting change for safer healthcare practices. Higgins and Meyer, along with their colleagues at the firm are known as relentless advocates for the rights of injured patients — always pushing for a better standard of care, exposing substandard treatment at many institutions and, ultimately helping to create safer hospital environments. See the full article here: Robert Higgins. 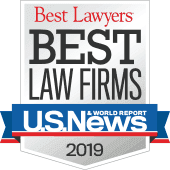 Attorneys practicing in Massachusetts, New Hampshire and Rhode Island.